One of the few great things in life is properly prepared and grilled trout. Here's a recipe for a whole grilled trout. Open the trout and sprinkle with 1/2 teaspoon salt, 1 Tbsp Jake's Pure Santa Maria Dry Rub, 1/2 teaspoon pepper and add fresh thyme. Combine thinly sliced mushrooms, shallots, salt, 1/2 teaspoon pepper and olive oil in a pan to sauté. Place sautéed mushrooms inside the trout. 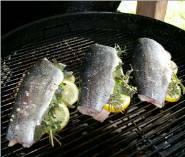 Tie the trout with twine, brush with extra virgin olive oil, salt and pepper. Prepare grill and have ready at medium heat at least 300 degrees and grill for four minutes each side. When complete move the trout to a single plate, let rest for 3 minutes then remove twine. Cut as required and serve.